This is the fourth title in the Calm for Kids range by Christiane Kerr. Created for teenagers, this high-quality download has 10 tracks ranging in length from three to eight minutes. 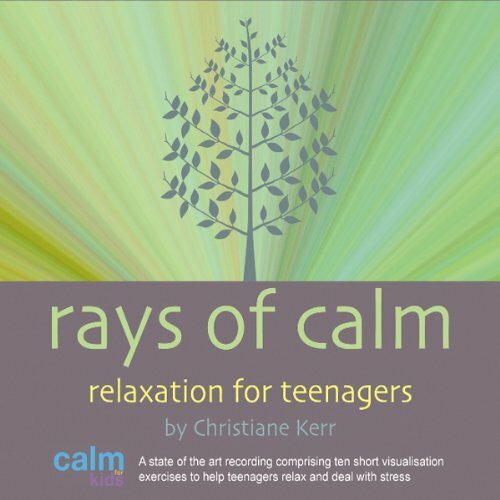 Christiane's soothing voice leads you through various relaxation techniques and visualisations designed to promote a sense of calm and wel-being and to help teenagers deal with stress. Each track is accompanied by beautiful music and calming sound effects composed and created by Pete M. Wyer. Christiane is a children's yoga teacher, specialising in relaxation and stress relief. She has worked extensively both with younger children and teenagers, and this download has been tried and tested with great success on her students in this age group. Great for listening to while lying in bed. Really helps to calm my racing mind down enought to be able to finally relax into sleep. hi, I loved this book! !it helped me sleep a lot thank you very much it was a very good book!! Got all her kids audible relaxation CD's. We have made this a nightly part of the bedtime routine for my 8 yr old who will not go to sleep without listening to Christine's soothing voice..We parents love it too and find ourselves falling to sleep at 8 O'Clock also! It was very relaxing and calming. Great in times of restlessness, stress and unhappiness. It leaves you feeling fresh and like a new person almost! It was very enjoyable and definitely did it's job! 😤 breath in 😤 breath out! U have 2 wait ages for the story to start up again because of the dumb music! Sometimes, there is no story! It does help u sleep though. U can buy it but it's not a must buy.